Well, you had a fair amount of Brunello – cheers! – and you feel ready to discover the wondefull Val D’Orcia (the Orcia valley). The Val D’Orcia is a fascinating place, where man have interacted with nature through the centuries in a way that has well reached perfection. Your Val d’Orcia One Day itinerary starts from Montalcino, which is covered in my One day in Montalcino post. 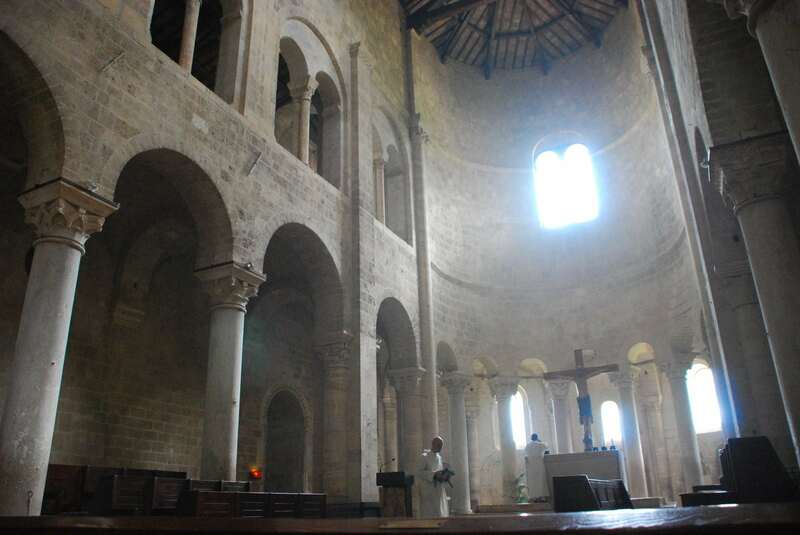 Coming out from Montalcino, only 10 km away, your first stop has to be St Antimo Abbey. 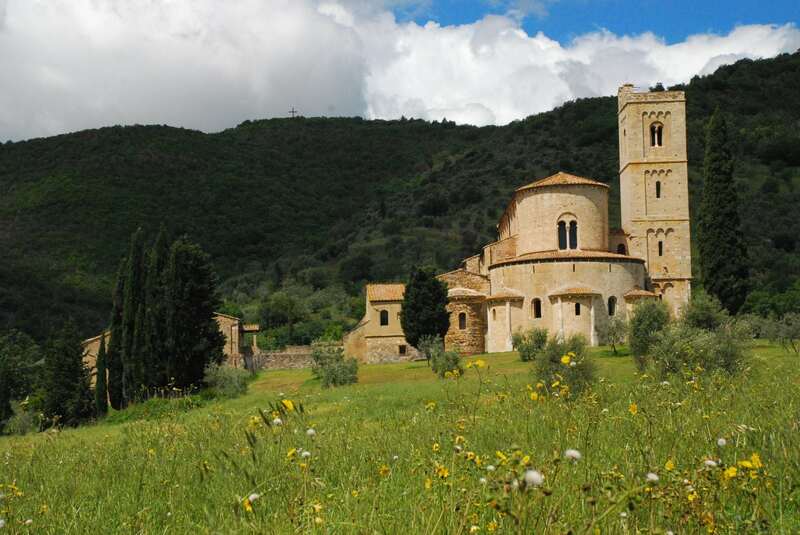 Sant’antimo is an extraordinary Romanesque abbey, one of the most important in the whole Tuscany. It’s famous not only for the elegance of its lines, but also for its setting in a beautifull valley, surrounded by wooded hills, olive groves and wine yards. Founded by the Longobards around 770, the abbey received the seal of emperor Charlemagne on his return from Rome in 781. The present church was build in 1118, to replace the original “Carolingian chapel”. The interior will strike you with with its alabaster walls and columns. 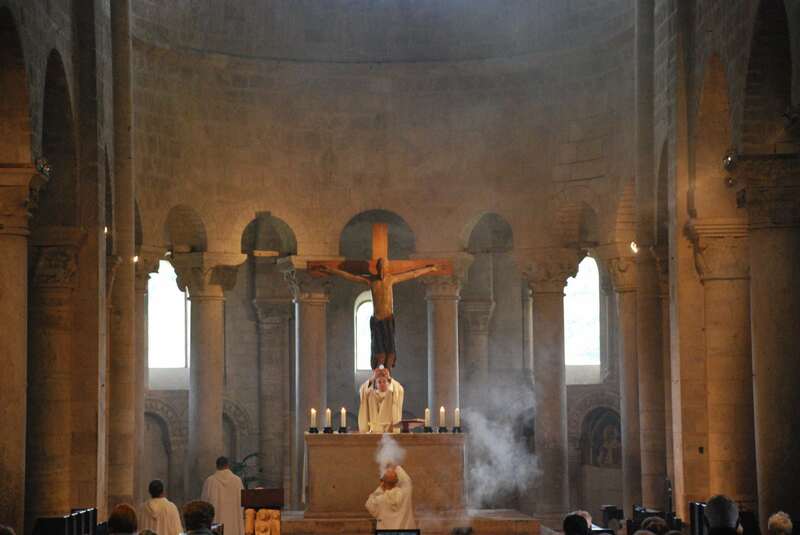 If you get there on Sunday morning, do spend some time to assist to the mass, and allow yourself the opportunity to hear the Gregorian Chant practised by the monks. Regardless to your beliefs, the atmosphere is unique, and, especially if you sit in the first rows, you will really get the feeling of assisting to a 12th century ceremony. Simply magical! (Sunday mass: 9.00 AM and 11.00 PM; the church closes at 12.30). Getting back on track, you can continue your itinerary in Val d’Orcia and head to Bagno Vignoni. It takes no more than half an hour by car, and the road twists and turns in the beautiful country side, letting you discover new breathtaking sights after each turn. 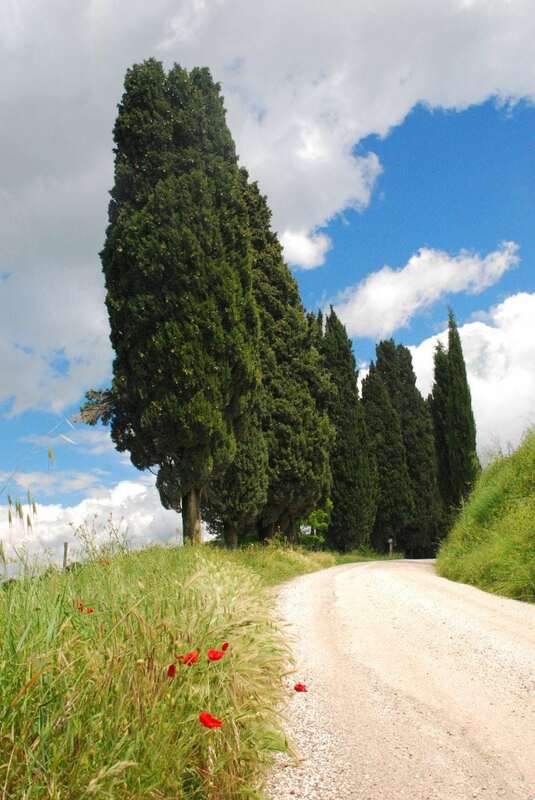 On the road, consider making a stop in the charming San Quirico d’Orcia, an important stage-coach post along the Via Francigena, the ancient road and pilgrims route running from France to Rome. Just after passing San Quirico d’Orcia, you will see the white incrustations on the side of the hill, left over the centuries by the thermal springs of Bagno Vignoni. Bagno Vignoni is quite a unique, off the beaten path place, and a highlight of your Val d’Orcia One Day itinerary. 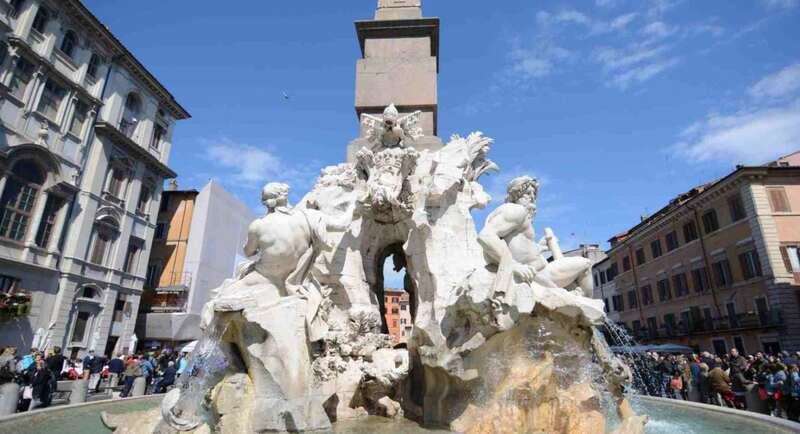 It’s thermal waters were already appreciated in Roman times. 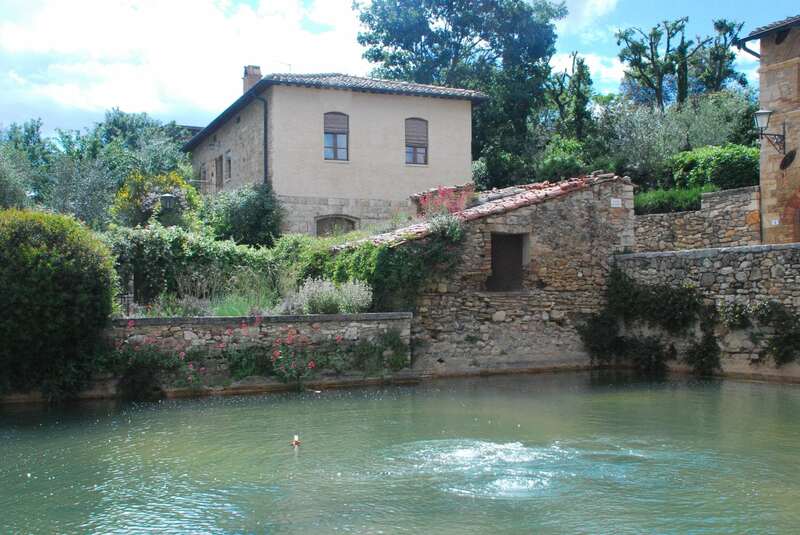 In the middle ages, a village developed around the large basin that constituted the ancient thermal structure. Caterina da Siena stood here several times before becoming a nun. After all these emotions, you are probabli rather hungry. Bagno Vignoni has several small restaurants, many of which give you the possibility of eating outside, and take advantage of the sun and the view. 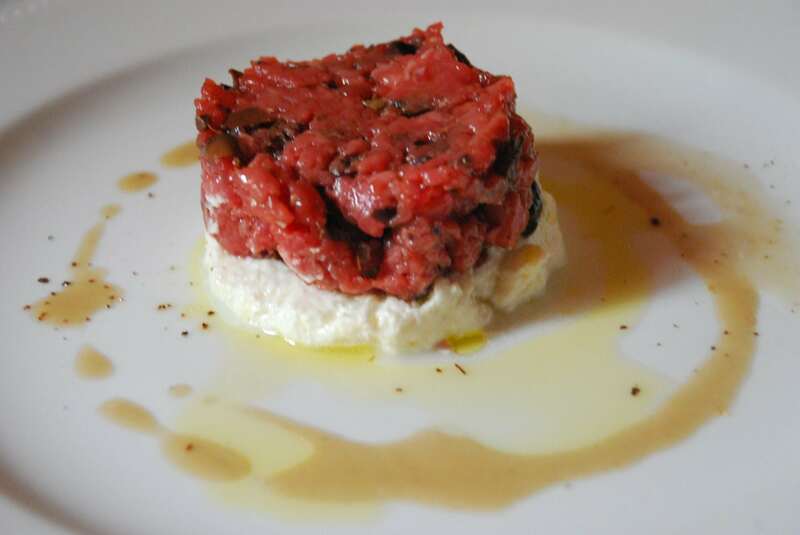 I suggest the Osteria del Leone, on the main square just behind the Loggiato di Santa Caterina, where I hd a delicious Tartare with olives and goat cheese. You can also take advantage of the local thermal waters spa and spend the rest of the afternoon induging in the warm water, with in front of you the astounishing view of San Quirico d’Orcia. Look for Piscina val di sole, close to the entrance of the village. If you get here at the end of the day, you may also consider to spend a romantic night at the Locanda del Loggiato, which has kept the fascinating atmosphere of a 1300 century house, with part of the original characteristic wooden beam ceiling and antique floor in terracotta. From Bagno Vignoni and San Quirico d’Orcia, take the country road to the lovely Montichiello hamlet, and admire one of the most iconic Tuscany views. You surely have seen it already on postcards, guides and coffee table books! The last stop of your Val d’Orcia itinerary in one day is Pienza, one of the jewels of Tuscan renaissance. Pienza, a Unesco world heritage site, overlooks the Val D’Orcia and is the first example of Renaissance “ideal city”. That is: a town built according to architectural criteria of antique classics that would impact directly on the human soul, stimulating spiritual well being. 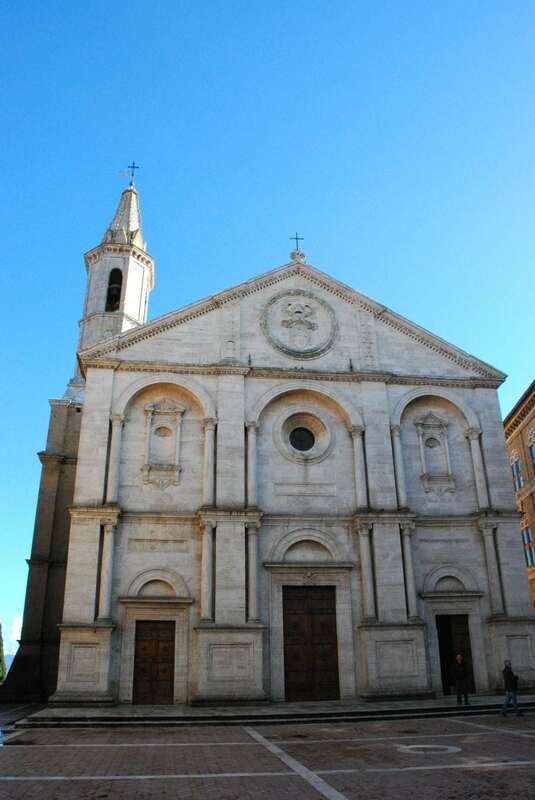 The most famous Pienza building is the cathedral, dedicated to St. mary of the assumption. It combines a renaissance façade with a gothic interior. Also notable are the palazzo Piccolomini, the town hall, the Borgia palace and st. Francis. But, most of all, you will enjoy walking down the corso Il Rossellino (the main street), loosing yourself in the lovely shops selling local delicacies. 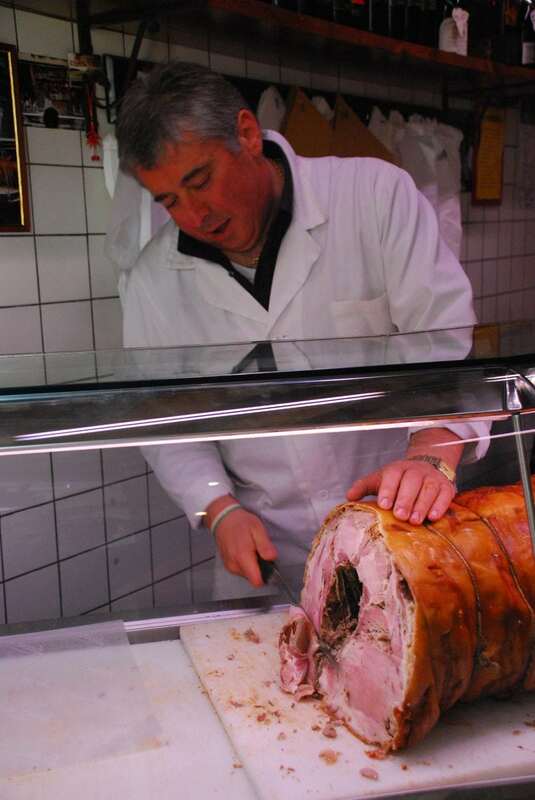 You must try Porchetta and worldwide renowned Pecorino di Pienza (Pienza sheep cheese). 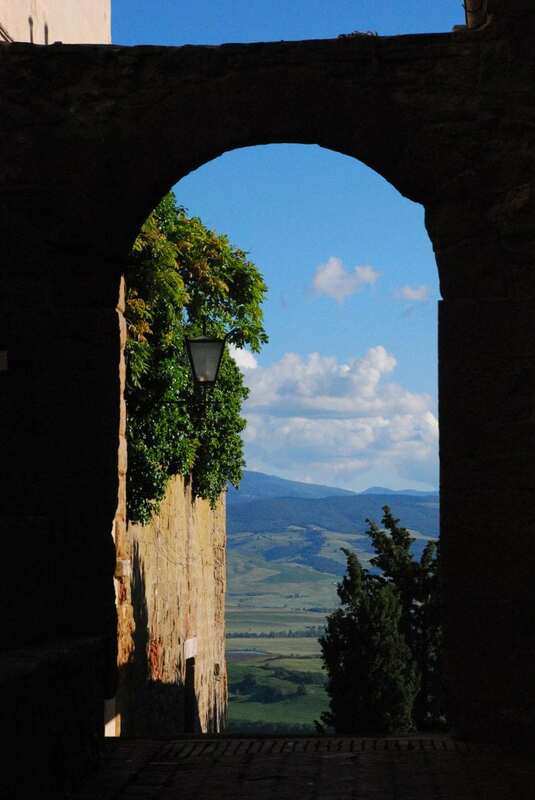 Before getting back to your car, don’t miss the walk along the old walls, for a last glance at the Val d’Orcia. After reading this post, you may want to spend more than a day in this lovely area. If you’d like to do so, here are two great options to spend the night. Castello di Spedaletto: it’s an authentic XII century castle, with great rooms and an charm you won’t find anywhere else. 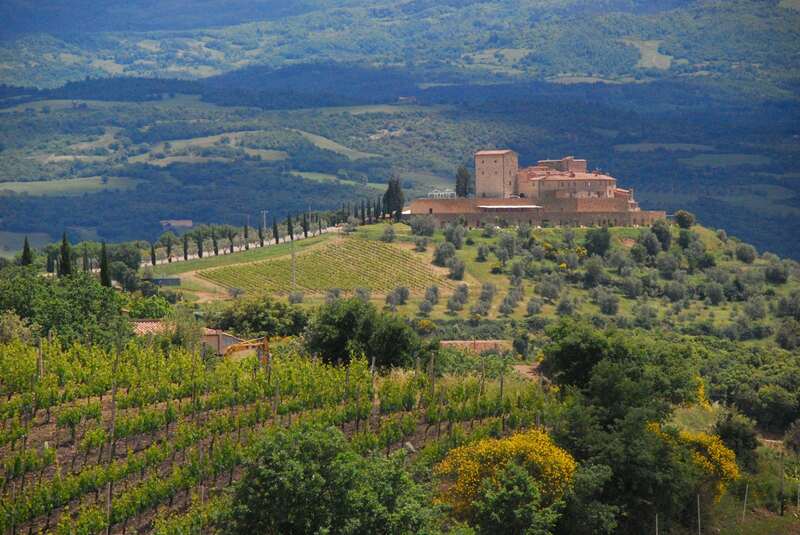 It’s located in the valley underneath Pienza, a 10′ drive from the city. Click here to check prices and availability. Relais il chiostro di Pienza: located close to St Mary church, in the heart of Pienza, it used to be a monastery before being transformed into one of the most romantic hotels you may think of. Its terrace and some of the rooms overlook the valley and offer astonishing views. Click here to check prices and availability. 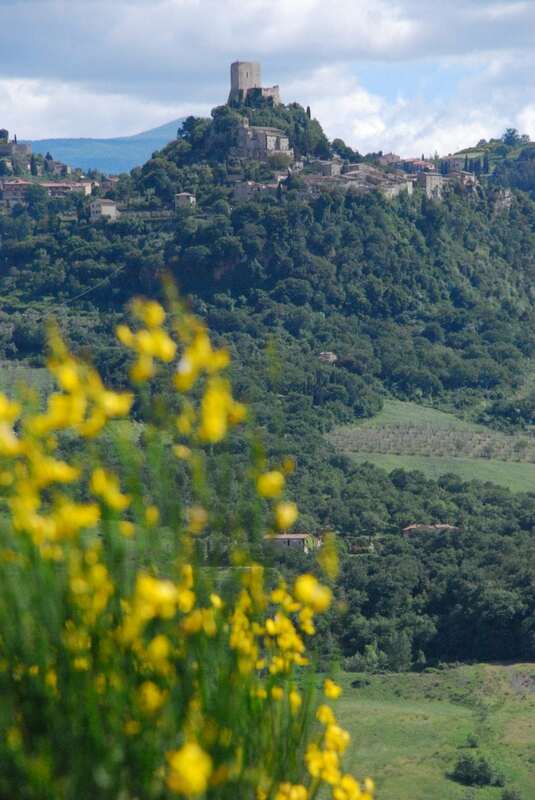 Enjoy your Val d’Orcia One Day itinerary! What an amazing description you made about these lovely places! I’ve been to both Bagno Vignoni and Pienza, and they are really delightful. So much enjoyed your post, from a complete Italophile. St Antimo is a very special place indeed. I think you might enjoy a post of mine about our visit to the Abbey: http://wp.me/p3gSod-wq. Yes I did, great post, I shared it on my G+ account. Thanks!